Island Expeditions have rewards — they have a lot of rewards. There are five mounts and 28 different pets, and I’m not even going to count how many different pieces of transmog gear they can drop. The problem has been that, until recently, nobody was quite sure how getting loot at the end worked. Now we have a general idea, but there are still unanswered questions. We don’t know if running Expeditions on PVP or Mythic difficulty increases the rewards, or if you still can get the best stuff even if you lose. I had almost given up on Islands, especially ones formed in the group finder. Odds are good that you’d get the lone hero going off on their own while the opposing team worked together… Which just made things frustrating. Even when Blizzard buffed their rewards early on, we still weren’t seeing anything fun or interesting drop. Sometimes we would win the Island before the second event would spawn — something that wasn’t that hard to do, especially if you were mining every Azerite outcropping and gathering up every crocolisk you saw. Emphasizing speed over everything else just wound up hurting our enjoyment. I gave Islands another shot when people started theorizing that rare hunting was the best way to get loot. Making sure to run with friends, they actually got fun when we started exploring the islands and ignoring the easy Azerite sources. I’m sure that the NPCs are pretty confused at all the Azerite just left lying around. Now that we have a plan, I’m confident that I’ll be able to get my hands on that beautiful green parrot: Squawks. 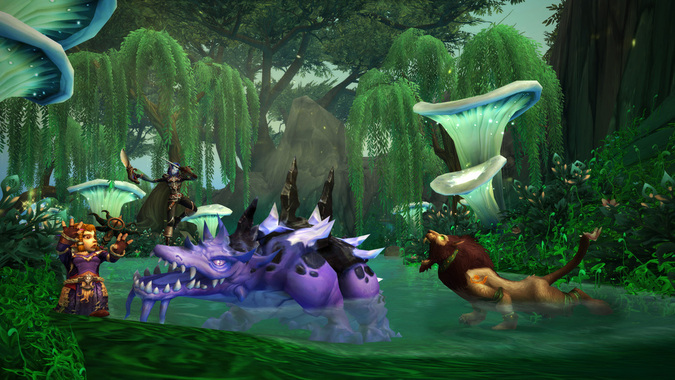 In the past, it’s been pretty clear about how to get big-ticket rewards like mounts and pets, with the exception of things like The Hivemind or Lucid Nightmare — but those are intended to be puzzled out. Do you think that Blizzard should add a tab in the Dungeon Journal with clearer rewards? Have you changed how you run Islands knowing there’s a system to try to target rewards that you’re interested in? What reward are you most interested in? If you’ve stopped running the Islands, is there anything that could be changed to get you out on the high seas again?